Rubber Stamping with Stampin' Up! and Ann Craig Independent Demonstrator. Welcome to my rubber stamping and scrap-booking website. I hope you'll enjoy searching the many pages of techniques and stamping examples that I've prepared for you. Use the Nav Bar down the side to navigate around and if there is something you can't find you are welcome to contact me for further information. Do you love rubber stamping, paper crafts, scrapbooking or making cards? Do you sit back admiring the work of others, wishing you could do the same? I can help you learn stamping and crafting techniques that will lead to lots of enjoyment, through creative experimentation in a variety of Rubber Stamping and Paper Crafting Techniques. What about creating those individual, hand-made 3-D or Off-the-Page projects? You can make simple little bags from envelopes or you can construct gift boxes, containers and pretty purses from card stock. Have you tried your hand at ATC's (Artist Trading Cards)? Make multiples of these creative little cards, learn the etiquette for trading them and develop a new social network of creative friends who collect and trade ATC's.This is an example of my first ATC. It is titled "Hot Summer Garden". Rubber stamping gives you many options for truly individual results on these tiny collectables. Are you searching for tips on how to use all those accessories, papers and ribbons stashed in the cupboard? 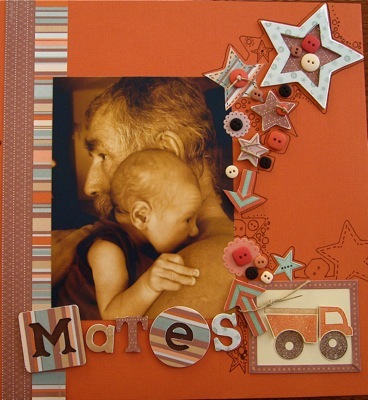 Scrapbooking is a fun and delightful way of using them up. Scrapbooking is individual in style and you can use anything you wish on your pages, so search out all that stash and combine it with great stamps, card stock and buttons, brads, chipboard, etc. and you can create amazing scrap pages, mini journals and unique decorator artwork. Rubber stamping on scrap pages gives you enormous creative scope to produce unique pages. Browse the SCRAPBOOKING section to find loads of information about combining stamping with scrapping and all the fabulous techniques you already use. You'll discover a whole new dimension to your pages. What about your STAMPS? You can't help but buy all the pretty stamps - they look so gorgeous. But... they sit in the cupboard waiting for later! The RUBBER STAMPING section of my site is here to help motivate you. Perhaps you haven't been taught how to use your stamps creatively, or you're a little unsure about techniques? Many of my friends and customers are amazed at how simple the techniques can be, even when they look complicated - so check out the free technique tutorials, gain confidence and knowledge in this area, and you will be creating what you previously thought were ADVANCED projects. Even tho' I've been involved in art education for over 35 years - either formally or informally, I was never exposed to the art of rubber stamping. Give me water-colour paints, acrylics, silk painting inks, screenprinting equipment, lumps of clay, metal shim, etching equipment, all things fabric, and I would happily advise you how to use them- but stamping? No! Now 4 years has passed since I picked up my first stamp and I am teaching classes in stamping and scrapping, experimenting with new techniques, writing a web site about Rubber Stamping and earning an income while Working from Home. Rubber stamping is most widely used for making GREETING CARDS. There are many occasions when a hand stamped card will have special meaning to the recipient. Cards can range in difficulty, time to create, and techniques used, but each one will have that special "I made it for you" tag that is invaluable and very meaningful. Do you struggle with ideas for card layouts? Click on the Mojo Monday button for an enormous array of ideas - you'll love it. There are lots of blogs and websites that offer prizes - "blog candy" - for entering challenges or leaving comments. The Midnight Madness challenges are inspiring and fun to attempt. Join in with crafters from around the world to challenge yourself on a weekly basis. There are so many rubber stamping techniques and you can see lots of them on my blog entries, so have a look. You can RSS the blog if you like - that way you'll never miss any of my postings. To help you feel confident and to increase your enjoyment of paper crafts - you need to know how to use your equipment in a number of different ways. Some information on COLOUR choices and combinations won't go astray either. Add to that some LAYOUT ideas and basic DESIGN PRINCIPLES and you'll be creating everything and anything, and you will be feeling relaxed and happy in the process..
You can gain that knowledge, and more, by following some of the simple ideas that you'll find on this site. You don't need to be a Rembrandt or a Van Gogh, but trying a couple of these hints will start you on the road to establishing your personal style, boosting your creative confidence and magnifying the amount of enjoyment you feel when crafting. Visit my new Stampin Up Demonstrator Business Web Site. It deals with all my Stampin Up business. Looking for promotions - you'll find them there! Hundreds of retiring Stampin Up products are available in our Last Chance List. Save up to 50%. Check your Wish Lists, but hurry as items are only available while stocks last. Feel like a creative break from the stresses of daily life? Grab a cuppa, relax and enjoy viewing the Stampin' Up Catalogues in the comfort of your own home. Find all you need to know about scrapbooking - where to start, free scrap maps, colour and pattern, stamping techniques, journalling ideas and embellishments. Customize cards for every occasion using a variety of stamping and embellishing techniques. Ann Craig shares Ideas to help you create the perfect card. Create exclusive stationary for special occasions. Use rubber stamps, ribbons, brads and other accessories to personalize invitations for all occasions. Origami boxes and matching note cards are lovely gifts for the festive season. Ann Craig shows you a variety of ideas using Stampin Up products, for friends, teachers and relatives. Embellishments come in all shapes and sizes. How do you choose what is right for your project? Ann Craig gives you a guide to what's available and how to make some unique embellishments of your own. If you need to find information on a variety of rubber stamping techniques, this is the page for you! Do you love a competition or creative challenge? New to this site - Monthly competitions with prizes and creative challenges to test your individuality. Join the fun. Here you'll find a list of topics that allow you to submit your work for inclusion on this website. Find your favourite technique listed, and send us and the world your best work. Add your examples and see your work on the world wide web. Just find a relevant page and upload your work, it is that easy. Christmas Projects Index - find a variety of Christmas projects using rubber stamping and Stampin' Up! products. 2 Step stamping is a very effective way to create eye-catching Christmas Cards. Ann Craig uses Stampin' Up's! Solemn Stillness for this project. Rubber stamp sets give you lots of options and come in many styles. See what you can do with co-ordinating stamps. 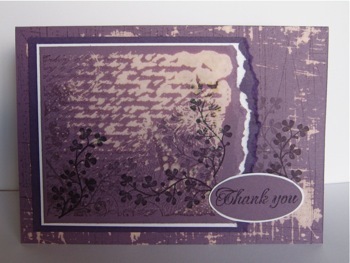 Stampin Up Demonstrator, Ann Craig - a little about me and stamping. What we, as crafters do with community service events to help others in need, while sharing days of fun, creativity and friendship. A list of the links to some of the other sites I visit. Explore them to find more information on topics of interest. Stampin' Up! has a wonderful offer for those of you who have been toying with the idea of becoming a demonstrator. You'll be assisting the Breast Cancer Foundation too! Stamp Camp - Christmas in July - register now! Join the Christmas In July Stamp Camp to get a running start on your handmade Christmas cards this year. Make 10 card. Extra packs available on the day to take home and complete at your leisure. Our fabulous scrapbook promo will leave you asking "where can I sign up?" Products and catalogues are included, so read the article for further details. Ann Craig's distINKtive designs team news for all down line members. Keep up to date with the latest happenings. Stampin' Up's! Sale-A-Bration starts soon. Combine this promotion with new stamps from the Summer Mini Catalogue and earn up to four FREE, limited edition stamp sets. Would you like to share your knowledge about rubber stamping? Great, find out how you can submit your story or tip here.